signified the state’s 710 incidents of child abuse or neglect reported each week. Why stop doing charitable work after a day or one month? Why not make volunteering a yearlong, industry-wide effort that becomes part of the collective culture? When it comes to doing good, more is better. That’s the consensus the Two Ten Footwear Foundation has taken with its Footwear Cares volunteerism initiative. 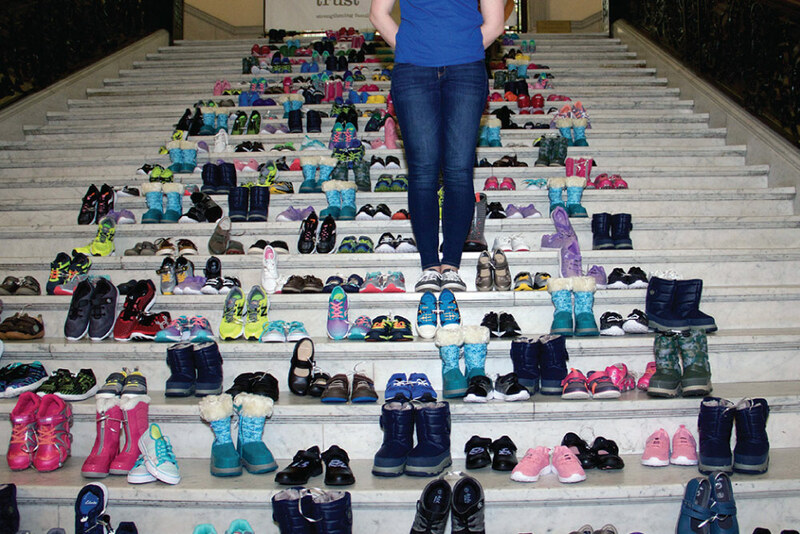 For the past five years, April (National Volunteer Month) has been designated Footwear Cares month where thousands of industry members participate in a broad range of charitable initiatives aimed largely at helping children in need. 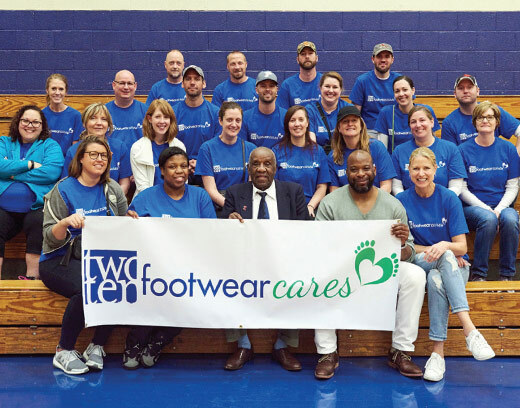 Footwear Cares (sponsored by Footwear Plus, Amazon Fashion, Jones & Vining, AAFA, FDRA, Kohl’s and Zappos) has been a resounding success as each year more industry members have participated and more good deeds were done. “Now that Footwear Cares is a year-round volunteer campaign, we’ll have events spread out over the next seven months which, in total, will eclipse last year’s single-month effort,” says Neal Newman, president of Two Ten. For those keeping score, Footwear Cares last year saw more than 7,000 individuals from 130 footwear companies serve local non-profits in 24 states as well as Puerto Rico, Canada, China and Switzerland. This past April saw plenty more good work being done as more than 50 companies participated in 30 events across the country. The highlights were numerous: Volunteers from Under Armour, Danner, FDRA, LaCrosse and Exclammability sorted 20,223 pounds of food at the Oregon Food Bank, which provided 16,853 meals for low-income families.Volunteers in Kansas from Payless ShoeSource helped organize and set up a new thrift store with the Topeka Rescue Mission, which will provide clean, good condition clothing at low cost for underprivileged families. In Milwaukee, teams of volunteers from Kohl’s, Weyco Group, Bon-Ton, Mojo Mony, Impo, Keds, Vida Brands and Reliable of Milwaukee packed 28 pallets of food “stock boxes,” the equivalent of 33,600 meals for low-income families and senior citizens. And at the Clark County Youth Center in Indiana, a shelter that provides area youths with a safe alternative when they have nowhere else to go, Shoe Sensation employees renovated the main living area and reorganized the kitchen. Newman also vividly recalls a brief conversation with a young Seattle woman who was at Northwest Harvest to pick up food for her family during Footwear Cares event with members of Topline, Washington Shoe Co., Nordstrom, FDRA and Earth Shoes. After Newman had told her about the type of events that were taking place across the country, she thanked him and remarked how she loves shoes but hasn’t been able to afford a new pair for a long time since falling on hard times. Newman says he was reminded how fragile life can be. “One life event can change everything, and that’s how important Footwear Cares is,” he says. Newman is pleased to report that Footwear Cares’ year-round initiative to gather all industry charitable efforts under its umbrella is being met with enthusiasm. “Many companies have year-round corporate social responsibility [CSR] programs and our previous April-only focus didn’t always align with their schedule,” he explains. “By evolving Footwear Cares into a 12-month campaign, we are able to support and integrate more companies’ CSR initiatives and help elevate awareness of the hundreds of companies that are doing good in their communities.” It also enables Two Ten to engage more industry members who, in turn, will help more people in need. “It’s truly a win-win situation,” Newman says. The plan going forward is to hold a couple of Footwear Cares group events each month in different cities while continuing to hold dozens of events in April. “We want to continue to build upon all this goodwill and celebrate our industry,” Newman says. Two Ten also plans to honor outstanding volunteers—individuals and companies—at its annual VIP Dinner & Gala in New York this November as well as throughout the year in its social promotions, newsletters, on its website and in Footwear Plus. “We want to demonstrate how ‘footwear cares,’” Newman adds. In that spirit, here are four profiles on how Wolverine Worldwide, Shoe Carnival, Skechers and Caleres gave back to their local communities via Footwear Cares in April. Snack packers: Wolverine employees packed 1,700 snack at Kids Food Basket, a non-profit providing meals to children in need in the Grand Rapids, MI, area. When it comes to Footwear Cares, Wolverine Worldwide has been all in since the beginning. Every year the Rockford, MI–based company’s goal has been to generate more good than the year before. Michael Bohnsack, director of community engagement, says it all starts by getting as many employees involved in its various charitable initiatives, and this April marked a record number at more than 3,500 participants spanning its three offices, six distribution centers, one call-in center and one factory. “This year was the single-biggest event we have every done for Footwear Cares,” Bohnsack confirms, noting a highlight was the many people who usually don’t volunteer who did. “To see new, young employees be part of this giving back drive was reenergizing and rewarding,” he says. It all began when members of Wolverine’s Boston-area office joined Two Ten at the Footwear Cares kick-off event held at the Massachusetts State House. Meanwhile, employees in the distribution centers spent the month collecting diaper donations and those in the company’s Rockford and Boston-area offices busied themselves putting together baby bundles (ultimate baby shower packages) with the goal to surpass last year’s 120 that were collected. “Children in need don’t have enough diapers, formula, swaddles, bottles, pacifiers or books—the basic essentials,” Bohnsack explains, noting that one in five children in America live in an impoverished environment. “We went well over our baby bundles goal and we collected several thousand diapers.” Taking the effort a step further, the Rockford drive was tied to ‘take your kids to work’ day. 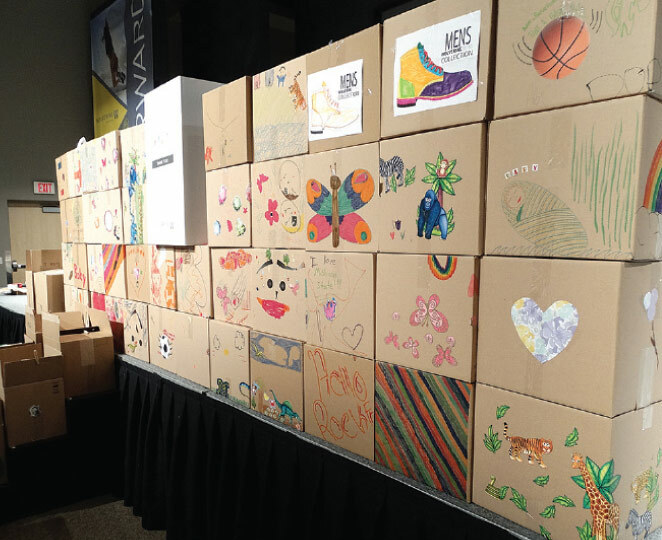 Children decorated the boxes holding the baby bundles. “We were able to teach the 70-plus kids that came to work with us what giving back was all about,” Bohnsack says. 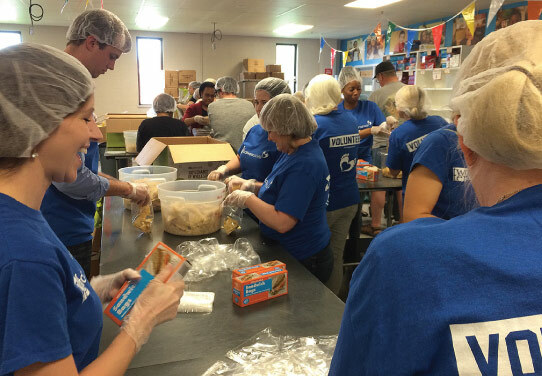 Last but surely not least, 16 Rockford employees spent a day at Kids Food Basket, a non-profit agency in Grand Rapids that provides about 7,500 meals daily to kids on federally funded meal plans in area schools. “We prepared 1,700 snacks in less than an hour-and-a-half,” Bohnsack reports. “The camaraderie, the teamwork, the feeling of doing something good all made for a great day,” he adds. Finally, Bohnsack believes Footwear Cares is a way to build company pride and work with fellow employees that one may not normally do. “We have 631 people in our Grand Rapids office spread out all over the place working on 10 brands, and they all came together on these projects,” he says. “It didn’t matter what brand you worked for or whether you were in finance, marketing or sales. We were all there to helping kids have a better way of life.” —G.D. Hammer time: Shoe Carnival employees helping build an Indiana home with Habitat for Humanity. Six years ago, Tom Vernarsky, DMM for Shoe Carnival, was listening to a presentation by Two Ten President Neal Newman about the importance of giving back to the local community. That’s when he decided he could do more and headed to the local Habitat for Humanity chapter to help build houses for people in need. A couple of years into what became a rewarding weekend volunteer gig, Vernarsky went to Shoe Carnival CEO Cliff Sifford with the idea that other employees might want to get involved. Specifically, that Shoe Carnival make a financial donation to the local Habitat for Humanity chapter and let employees work on the homes. Sifford was immediately on board. 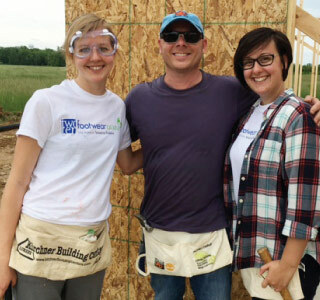 The first year saw about 35 employees volunteer, participating in teams of six to eight for one day a week over the course of the approximately five-month span to build a house from the ground up. Last year, the number jumped to 70. This year, Vernarsky reports, it should top out around 75 volunteers. To date, the employees have helped build 21 homes and are slated to build 10 more this year. Tying what has become an annual effort to Footwear Cares was a no brainer, according to Vernarsky. The Evansville, IN–based chain has long been active in numerous charitable causes, including the Tri-State Food Bank, Ark Crisis Child Center, Youth First and Lacey’s Laces (benefitting Pediatric Cancer and Breast Cancer Awareness month) as well as is a big supporter of Two Ten. The fact that the homes are built over the course of months aligns perfectly with Two Ten making Footwear Cares a year-round initiative. As for the work, Vernarsky says novices to skilled carpenters are welcome. Volunteers do everything, be it framing, siding, painting, installing plywood and insulation. “I sent six women to one site and the construction manager thought I was crazy, at first,” he recalls. “But the manager was really impressed—they were all pounding nails and one worked the reciprocating saw.” A bonus, Vernarsky says, is Shoe Carnival employees from across the company work together. “I overheard a lot of, ‘Oh, I’ve seen you in the breakroom but I didn’t know what area you worked in.’ Or, ‘I’m new and this has been a great chance to meet other people in the company,’” Vernarsky says, adding it’s been an amazing camaraderie builder. “They’ve worked together in 95-degree heat and when it was 25 degrees, and no one complained,” he says. “Everyone was eager to help and all felt a sense of accomplishment knowing they helped people in need.” —G.D. Meal makers: Skechers employees packed 1,600 meals for the elderly at the Los Angeles Regional Food Bank. In the early days of Footwear Cares, Skechers SVP of Sales Rick Graham got a call from Two Ten asking the company to join the cause. Already active in numerous charitable initiatives nationally and in its local Southern California community, Graham tasked Human Resources Manager Melissa McKay with the job of tying some of these efforts to Footwear Cares. “I didn’t know what I was getting myself into,” McKay says. “We took conference calls with other businesses in SoCal and planned our first volunteer trip to the Los Angeles Food Bank about four years ago.” It was a big success and the company has been an active participant ever since. McKay says Skechers hosts a range of volunteer opportunities throughout the year—events she’s eager to link with Two Ten’s yearlong Footwear Cares initiative. “They’ll get to see what we do all year,” she says. Examples include volunteering at The Compton Initiative four times a year, an effort that helps paint community buildings, houses and schools. Skechers employees also visit a local children’s hospital every Thanksgiving to help provide meals and entertainment to families, donate clothes to 1736 Family Crisis Center for victims of domestic violence, conduct a holiday food drive for Los Angeles Regional Food Bank, hold the annual Pier To Pier walk benefitting children with disabilities, conduct blood drives for Red Cross and the UCLA hospital, donate to Autism Speaks…the list goes on. Sweat equity: Caleres employees played games with children at the Mathews-Dickey Boys’ & Girls’ Club in St. Louis. Caleres has been an active participant with Footwear Cares since its inception in 2013, having rounded up an impressive number of volunteers across its portfolio of wholesale brands (includes Naturalizer, Dr. Scholl’s, Sam Edelman and Allen Edmonds) and from its Famous Footwear retail division. Efforts have spanned volunteer days working with community centers to working in food shelters and boxing items for crisis nurseries. Each year, the objective has been to get more employees to volunteer. Julia Marsh, corporate communications manager, says it has involved a range of efforts, like in 2014, which coincided with the St. Louis–based company’s 100th anniversary on the New York Stock Exchange. “We tied the milestone to Footwear Cares by registering 100 associates to volunteer,” she says. This year, Marsh started planning early in an effort to get Caleres on board with Two Ten’s initiative to group companies within their respective cities. Caleres teamed with New Balance, and 25 associates across both companies volunteered at Mathews-Dickey Boys’ & Girls’ Club to facilitate its field day activities for the Riverview Garden School District. Although the day had to be moved indoors due to rain, it was a smashing success filled with indoor hockey, arts and crafts, basketball, dance, gymnastics and even DJ’ing. “The students had a great time,” Marsh reports. “We enjoyed pizza with them, and thanks to a generous donation from Under Armour, we were able to gift each student a Sackpack.” Before handing out the packs, Wendell Covington Jr., president and CEO of Mathews-Dickey, delivered an uplifting speech to the kids. “The amount of gratitude the students showed was humbling,” Marsh says. Marsh was also impressed by the Mathews-Dickey team, who met with volunteers before the children arrived to offer advice on how to share their career experience with the students and illustrate how a skillset can lead to a profession later in life. “This was great advice, and it was fun talking to the kids about the spectrum of different jobs the volunteers hold,” she says, adding that the opportunity to help kids was a “treat” for everyone. The overall goal with Footwear Cares, Marsh says, is the same every year: “To give our associates an opportunity to give back in our community, represent Caleres and to be reminded of all that Two Ten does.” Marsh is already working on opportunities to make Footwear Cares a year-round program. “Giving back to our community is something Caleres believes in strongly and we encourage and applaud those who give themselves,” she says. “No matter how we’re giving back, it’s a great motivator to do more and be involved in the communities where we live and work.” —A.L.